Trenches – Any kind of long, deep hole is easy to dig using the bucket on the backhoe, from digging a trench for a septic system or burying an electrical line. Footers – Though many would do this by hand, the backhoe makes footers efficient and easy. Septic Systems – Septic Systems are usually underground, and the only way to get underground is to dig. Dirt – the backhoe can move mounds and mounds of dirt around, and it can pick it up and put it where it needs to be. Snow removal – The backhoe can push small or large piles of snow, and it can also move snow from the street to the dump truck to be taken away when clearing parking lots and roads after a big winter storm. 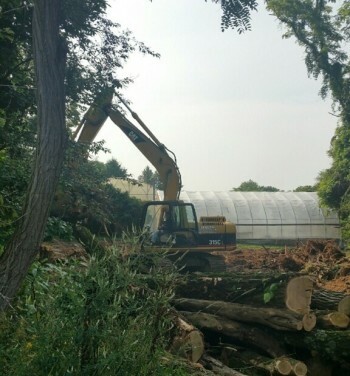 Trees – Uprooting trees is among one of the more interesting jobs a backhoe can do – and it does it literally. The major roots come up and the tree is moved to a new location or to the dump. Debris – garbage, rubble, dirt, tree limbs…you name it, the backhoe can clear it away using one or more of its accessories. Yards/property: A new piece of land needs to be properly graded, or “evened out” before the contractor has completed the job. The backhoe is the best machine for coming into your yard and leaving it better than when it arrived. Roads: Backhoes have a smooth side to their buckets that can be used to even out gravel and dirt road surfaces.